I’ve been a big van of hefeweizen beers for some time. “Hefes” are primarily wheat based in their flavor and for some reason perfectly match with my taste buds. 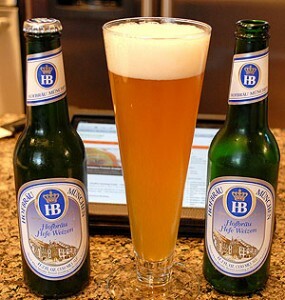 I had yet to try an authentic German hefe though, until I snagged a sixer of Hofbräu Hefe Weizen. This is one of the original hefe’s, dating back some 200 years and originating in Munich. This rendition of the hefe is much stronger than I’m accustomed to and has a much thicker head. It didn’t taste much like the dozen or so American hefe’s I’ve had. It took some getting used to, but the taste grew on me big time. I really like this beer and I’ll be getting more when I have the chance. American hefe’s don’t compare to this one.